Sedella, Salares, Archez, Canillas de Albaida, Canillas de Aceituno, Competa, all villages which stand at the foot of the impressive Tejeda and Almijara Sierras; all morisco (Moorish convert to Christianity) villages, where vines were the main crop and are still an important element in the landscape as well as the economy; all display similar characteristics, reflecting the true essence of the Axarquía region, its scenery, its way of life and its history. The highlights of the village are St. Andrew’s Church and the nearby Turret House, with its adjacent Mudejar tower. The Sierra de Tejeda locations of La Maroma (its highest peak), Cueva Horeada cave and El Salto del Caballo all lie within the village boundaries. The village was formerly known as “Villa del Castillo” (“Castle Village”). The uncertainty surrounding the origins of its name have led to a number of strange conjectures, such as the following: “when Isabella the Catholic was informed of her troops’ victory over the Moslems in the area, she answered ‘sé de ella’ (‘I know’) and thus the location was named Sedella”. It seems more likely to be derived from the Latin “sedilia”, meaning “rural possessions”. It appears in 7th-century records as part of the Bishopric of Malaga under the name Sedilla, while during the Moslem occupation it was called Xedalia. The village square is home to a tower, decorated on one side with fresco paintings. This is referred to in documentation as “the Keep” and would have been part of the fortress -of which some sections of wall still stand- and of the residence of the lord of the village. After surrendering to the Catholic Monarchs (1487), ownership of the village was given to Martin Fernandez de Cordoba, though it came under the jurisdiction of Malaga in 1513, despite opposition from Velez, which also claimed the same right. 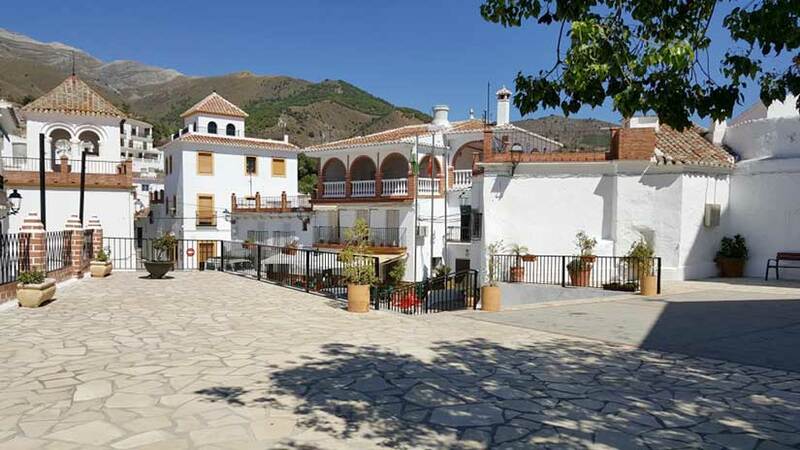 Years later, 1569 saw an almost general revolt by the moriscos (Moslem converts to Christianity) of Sedella, Cutar, Benamargosa, Competa, Salares, Daimalos and other villages in the Axarquia region against Christian rule; the rebels established themselves at El Peñon de Frigiliana, where they were finally defeated by the governor of Velez, Alvaro de Zuarzo. His ruthless oppression was followed by the definitive expulsion of the moriscos from the area. On Christmas Day 1884, the village and its municipal area were shaken by the major tremor known as the Andalusian Earthquake, the extensive material damage suffered including the total destruction of the parish church.